Construction workers on the site of a six-unit apartment complex under construction in Ellsworth in this July 11, 2018, file photo. Despite a tight market for skilled workers, construction employment rose in 33 states in January, with Maine among the top gainers by percentage. Maine gained 800 construction jobs from December 2018 to January 2019, according Associated General Contractors of America data released Monday. That’s up 2.9 percent for the month’s gain, ranking Maine fourth among the 50 states and District of Columbia. The numbers were not as rosy when comparing the full year from January 2018 to January 2019. Maine lost 1,300 jobs, down 4.5 percent during that period. That ranked second to last, just above Vermont, in the number of construction jobs lost. 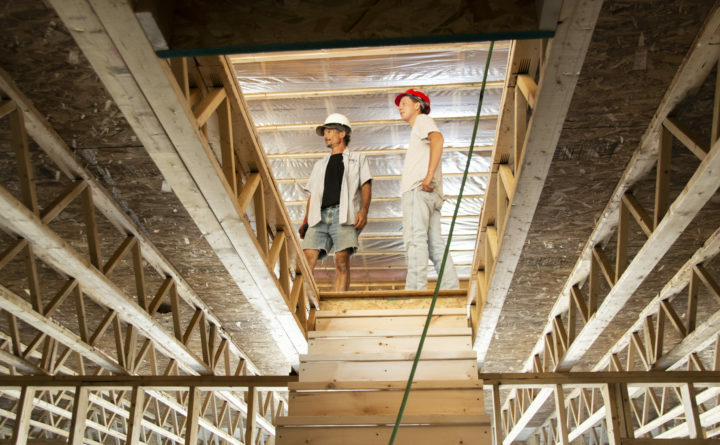 Even with Maine’s recent turnaround, association officials cautioned that the employment gains may not last without an increase in the number of people trained for construction careers. “Contractors began 2019 by adding employees in nearly all parts of the country,” the association’s chief economist Ken Simonson said in a prepared statement. Nearly four out of five construction firms expect to add employees in 2019, Simonson said. That’s based on a survey the association released Jan. 2. That survey found that 25 percent of Maine respondents said they increased hourly pay rates to make jobs more attractive, while 13 percent provided incentives or bonuses. About 38 percent increased benefit contributions. Maine contractors are tapping into technology, with 33 percent saying that they invest 1 percent to 1.9 percent of their annual gross revenue in information technology. As for what keeps Maine’s construction company executives up at night, 50 percent said worker shortages, 25 percent said safety and another 25 percent said not enough private work. Because of the mismatch between jobs and qualified workers, 57 percent of companies said they plan to invest more in training and development in 2019. The association called on federal officials to double investments in career and technical education programs to expose more high school students to construction opportunities.